Just when I thought automakers weren’t paying any attention to the needs and desires of the true enthusiasts, we get this incredible sign (a literal sign, even) that, yes, at least one automaker still cares. What you’re seeing here, in a picture taken just today, is a billboard on the I-294 near Chicago’s O’Hare airport. A billboard for a Ford Probe GT. Hot damn. This picture was sent to us by an eagle-eyed reader named Jan, and we’re very confident it’s real and not something taken in 1997, the last year the Ford Probe was produced. Look at the picture: that’s clearly a very recent Acura TL there (2009-2014 or so? ), and that billboard in the background is for a Chicago Travel Show that just happened January 21-22. This is happening now, people. 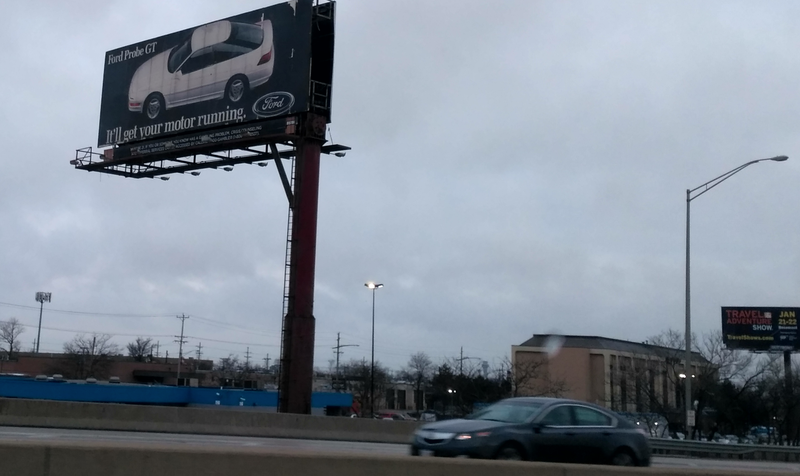 So that has to mean that the billboard is a teaser for a rebirth of the Ford Probe! The Probe GT, even! And, based on the billboard, Ford’s made the wise decision to bring it back with exactly the same styling it had back in the late ‘90s, down to the three-spoke wheels and the now impossible-to-find-on-a-new-car pop-up headlamps. This may mean that Ford and Mazda are getting back together, after their split in 2013? After all, the Probe was like 60 percent Mazda. It’s possible Ford is making the new Probe completely internally, but who knows? This is so exciting. I mean, what else could this mean? That, somehow, two decades of billboard layers were peeled off this billboard, revealing an ad that hasn’t seen daylight since the Clinton administration? Not likely. There’s going to be a new Probe! I’m giddy. Ford, please consider this my demand to be invited to the launch event. I like my steaks rare, and I wear a medium for Probe promotional shirts and outerwear. Also, be sure to bring back the Wild Orchid special edition. Is The Ford Probe Still A Good-Looking Car?